Meet your hosts, Shelby and Christa Newhouse. 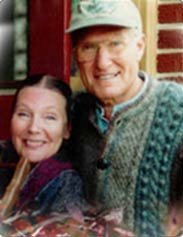 This husband and wife team has produced, directed, written and edited motion pictures and videotape programs for forty years. Shelby, always seeking a new audience, will relate adventures and miss-adventures. Christa is recognized as a fiber artist, instructor and knitwear designer. For the past 14 years Shelby and Christa have enjoyed visits from guests from all over the world. Guests from Argentina, China, Uruguay, Great Britain, Germany, Spain and even Mongolia. And of course from the United States. Guests from Hawaii are welcomed with MAHALO.